QPR have confirmed the signings of Newcastle defender Peter Ramage and Slavia Prague goalkeeper Radek Cerny. Ramage, who has been at St James' Park since he was 11, has agreed a three-year contract in the hope of getting regular first team football. The 24-year-old made 45 league starts during his time at Newcastle. 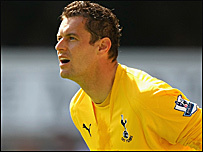 Cerny, who has been at Tottenham on loan since January 2005, has agreed a two-year deal. The 34-year-old Czech started 20 games this season for Spurs. He is set to become the third Czech keeper to play for the R's, following in the footsteps of Jan Stejskal and Ludek Miklosko.